HMRC (the UK tax authority) have finally announced how UK businesses should submit details of their digital sales to other EU countries for their new VAT MOSS system. In my opinion, what they are proposing is utterly bizarre. 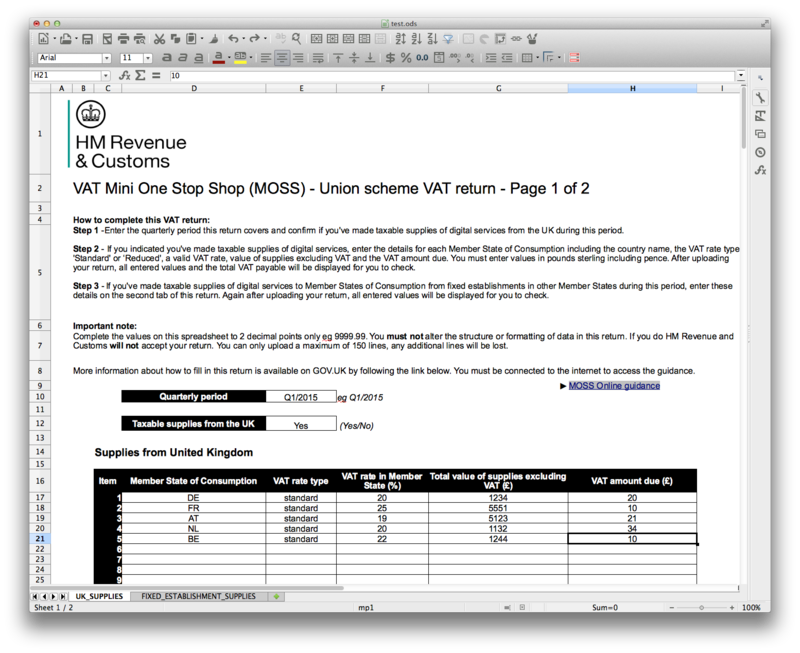 You can manually type all the data into the HMRC website. 2 .You can submit all the data into a formatted Excel/ODS file (see below). As you would expect, there is no public API to allow this data to be submitted automatically to HMRC. Such a system may exist for “agents” but that doesn’t help us people who a) write our own billing systems or b) don’t fancy paying third parties to do trivial things which we should be able to do in-house. I’ve made an API to help developers who need to generate one of these ODS return documents with their own data. It’s a simple HTTP API which allows you to submit a JSON hash with your return data and will return a correctly formatted ODS for your use. This is live right now and you can use it by following the instructions at mossreturn.uk. If you’re a Ruby developer, and would rather create this file within your own application. You can use my MOSS Return Generator Gem which is what powers the HTTP API at mossreturn.uk.